With new mid range and high end graphics cards from both ATI and Nvidia currently creating a monumental flux in terms of price and performance, and newer graphics cards pushing down prices of older yet still capable models, things are getting quite interesting for the consumer at the moment. The mid range especially has seen cards like the Radeon HD 4850 and GeForce GTX 260 drop in price quite dramatically with the former now available for around £80 in the odd 'this week only' deal. 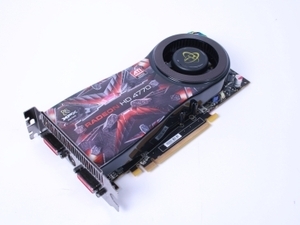 The two HD 4770s we've already looked at have returned results slightly below that of the HD 4850 so, in some cases, it's worth opting for the older graphics card if you come across a good deal. 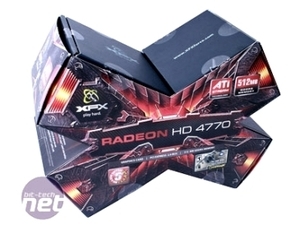 However the HD 4770 is here to stay and the HD 4850 will soon go the way of the Dodo so it's important to get some idea of how the HD 4770 shapes up in the overall scheme of things. Firstly it's cheap. Our XFX model retails for just over £80 and with the economy (and exchange rate for those of us in the UK) hopefully having bottomed out, this will mean it can only get cheaper as the weeks go by. For your hard earned cash there's a copy of Tom Clancy's H.A.W.X. which is a nice addition to an £80/$99 package although it will probably leave a sour taste in the mouths of die hard flight sim fans. 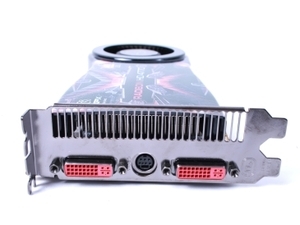 In the funky X-shaped box, accessories include the standard affair of a CrossFire-X bridge connector, DVI to HDMI and DVI to D-SUB adapters as well as a video out adapter and, in case your PSU doesn't come equipped with 6-pin PCI-E power connector, there's a Molex to 6-pin adapter thrown in too. 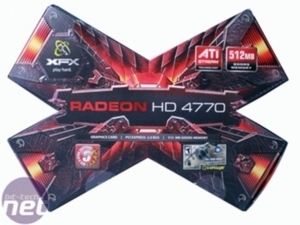 XFX includes an attractive array of support options and the 5-Star Support programme that comes with the HD 4770 not only covers you for the lifetime of the card, it's also transferable so if you sell the card at a later date when you upgrade, so long as the new owner registers with XFX within 90 days, XFX will transfer the lifetime warranty to them. This can only happen once but seeing as the main downside to purchasing second hand graphics cards is that they rarely come with a warranty, this would mean you'd more than likely get a better price for your card if you came to sell it.